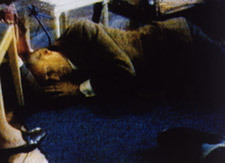 One of Chris Marker's few fiction films, THE EMBASSY shows political dissidents seeking refuge in a foreign embassy after a military coup d'état in an unidentified country. Over the next few days, more and more people fleeing the military assault-teachers, students, intellectuals, artists, and politicians-arrive at the embassy. An anonymous cameraman records the tense situation with his Super-8 camera, and provides a voice-over commentary, as the Ambassador and his wife arrange to house and feed the growing group, who monitor radio reports of the alarming political developments-including thousands of political prisoners detained in a stadium, and reports of executions-and glimpse activities on the streets outside. The refuge-seekers accommodate themselves to the makeshift living arrangements, find ways to pass the time, and engage in often heated political debates. The Sixth Side of the Pentagon: Chronicle of the 1967 Mobilization to End the War in Vietnam protest march on the Pentagon, by documentary essayist Chris Marker. Also on this disc is a second film, THE EMBASSY.